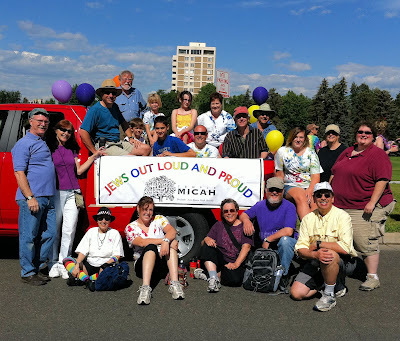 Temple Micah Advocacy Blog: Temple Micah Pride A Success! Temple Micah Pride A Success! Thank you to the 20+ people that came to march with Temple Micah in our first ever entry in Denver's Pride Parade on Sunday. We had a great time decorating the truck and showing our pride! The 200,000+ crowd enjoyed seeing Jews in support of LGBT rights. For the first time in the parade's history, there were four Jewish organizations and synagogues represented in the parade, including Keshet, ADL, Temple Micah, and B'Nai Havurah. If you missed out this year, don't worry, you'll have the opportunity to join us next year!